We encourage over 4,500 students to think provocatively and question the world through our diverse disciplines. La Trobe’s Humanities Department has received global accolades for many of its subjects. We rank in the top 10 universities in Australia for nine subject areas including: Anthropology, Archaeology, History, Linguistics, Philosophy, Politics & International Studies, Social Policy & Administration, and Sociology (QS World University Rankings by Subject 2016). 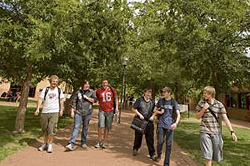 La Trobe ranks as the top university in Victoria for research in Archaeology and Tourism, and first equal for Political Science. We also rank in the top 3 universities in Victoria for research in Anthropology and Linguistics (ERA 2015-2016 assessment). Welcome to the School of Humanities and Social Sciences. Explore our resources and activities for primary and secondary school students.